Back in March, we started rolling out a new version of BBC iPlayer: designed for a multiscreen world, so the experience is consistent, but optimised across PC, tablet, mobile and TV devices. We’ve had some great feedback so far, but lots of you have been asking when new BBC iPlayer will be coming to the devices you have. So today, I can update you on the roll-out on Connected TVs. As I outlined in my previous post, over time, we are looking to migrate the majority of all existing devices to the new version. However, with BBC iPlayer now available on over 1,200 devices, this is a major task and will take a bit of time. Today, I am happy to announce the next wave of devices is ready to go. These will be rolled out over the coming week. For full brand and model information, please refer to the BBC iPlayer help pages. The eagle-eyed amongst you will see the list above includes a number of devices that are currently using our ‘Bigscreen’ version of BBC iPlayer - which launched over five years ago and is currently only being used by 0.1% of BBC iPlayer users. With this in mind, limited resources, and new BBC iPlayer rolled out to over 85% users, we’ve had to make the tough call to retire the ‘Bigscreen’ version. This means that from next month (September 2014) some devices that are using this ‘Bigscreen’ version on some TVs, Blu-Ray devices and PCs connected to TVs will no longer have access to BBC iPlayer. There are lots of other devices that can access BBC iPlayer and for the full list please refer to the BBC iPlayer help pages. Please note that we have a similar looking service based on MHEG technology for Freesat compatible devices. This is not closing in September. Q. 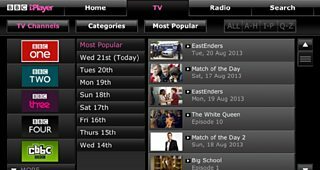 What about the versions of BBC iPlayer on Virgin Media Tivo, YouView, BT Vision and other devices? A. We are working with YouView, Virgin Media and BT to bring new BBC iPlayer to these platforms. Whilst I cannot announce dates, we are targeting this year for these platforms. Similarly, other devices on our legacy version of BBC iPlayer will be migrated to the new version this year as well. Q. You said Xbox One was coming soon – any update there? A. Yes. I am happy to announce that we’re aiming to launch new BBC iPlayer on Xbox One by the end of this year. We have completed four releases to this product since we launched out of preview in May – this has included a number of fixes and improvements to performance of the product on all devices. Some of you will have noticed better video playback performance, clearer labeling and a number of other minor improvements that we have made in response to both audience feedback and usage data. As always, I love hearing your feedback, so please drop me a note below with suggestions for how we can make BBC iPlayer even better on Connected TVs. Marcus Parnwell is Executive Product Manager for BBC iPlayer on TV.